Handsome and understated, these Solid Wood Card cases hold 1 or 2 bridge or poker size playing card decks (each in tuck boxes). A black, velvety interior protects the decks and holds them securely in place. Each Card Boxes hinged lid is laser-engraved. You can choose from Golden Oak, Light Mahogany, or Cherry color Card Boxes (Cherry is only available in double sizes). NOTE: Regular Playing Cards and Custom Playing Cards are sold separately. The minimum order for bridge or poker size One-Color Custom Imprinted Playing Cards is 25 decks. The minimum order for poker size Full Color Digitally Printed Custom Playing Cards is 10 decks. 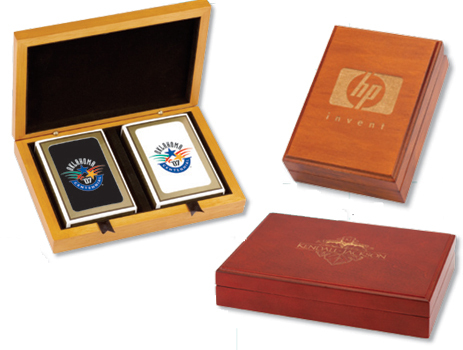 It's easy to have Branded Corporate Playing Card Box Sets. Simply call 1-800-233-0828, and submit your camera-ready artwork to graphics@kardwell.com (you can also mail your art). Delivery time is about 3 to 4 weeks. Rush delivery is available for an additional charge.